Okay. 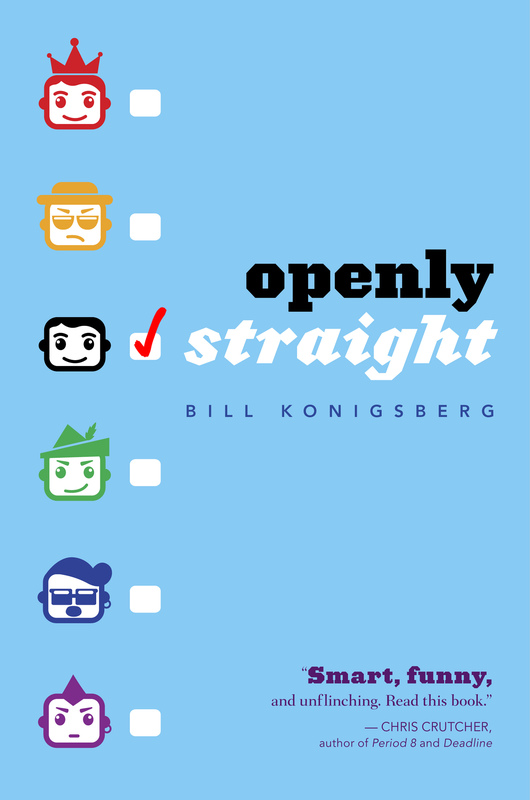 So I get lots of feedback on Openly Straight. I get it via email, I see it online on blogs and on reviews on sites like Goodreads and Amazon. The one aspect that is discussed more than any other is the ending. Now I promise: no spoilers here. Well, that’s not exactly true. I will try to not get too specific, but it may be hard as this post goes on. Still, if you want to know how the book ends, you’re going to have to read it! Suffice it to say that some readers love the ending because it isn’t wrapped up so neatly. Other readers reported throwing the book across the room for exactly the same reason. Incidentally, my first novel, Out of the Pocket, was knocked for being wrapped up too neatly. So yeah. Hard to win. But that’s okay. I just want to discuss for a moment my reasons for ending the novel the way I did, and some of the lessons I’ve learned from having done so. I ended it this way because I simply cannot see how else it could close. Given my characters and their backgrounds and motivations, it just doesn’t make sense to me that everything would be all hunky-dory after Rafe does what he does, and says what he says. I love Rafe. I don’t want him to hurt, but then again I don’t think by the end of the novel that he is hurting that much. Oddly enough, I thought I was ending the novel in an “open-ended” and upbeat fashion. Where some readers have called it a less-than-happy ending, I think that next semester could indeed be very happy for Rafe! I think his love interest needs some time. And frankly, I think he needs some time, too. To reflect upon his motivations for having done what he’s done. To reflect upon being who he is for once. And by the way, I reject the idea that “nothing happens” at the end of the novel. The final scene, to my mind, absolutely ties up a shift in Rafe’s understanding of his role in the world and reflects a significant shift in philosophy for Rafe. Re-read the first chapter, think about the cameras, and then read the final two pages again. Along the way, reflect upon the role of the camera in Rafe’s world. 2. What did you learn from writing this novel, and from ending it as you did? I had no idea what she meant! It turns out she forecasted correctly the impact of my ending on some of my readers. What I didn’t understand, and what she very much did, is that for the first time in my life I had written a romance. Rafe falls in love in this book, and his love interest falls in love back. This wasn’t what I set out to write, but it happened. What i didn’t get is that there are RULES in romances. Now, some authors subvert the genre, particularly those writers who are writing literary novels that happen to include a romance (see Rainbow Rowell’s Eleanor and Park). But readers who read romances have expectations, and when you flaunt their expectations, they tend to want to throw the book across the room. To those readers I say, Sorry! It was not my intention and I totally get it. But as I said before, I don’t think the relationship is without hope in the future. I think, in fact, that the two characters will be friends next semester. Maybe even more. I just don’t know yet! As much as the ending completely ruined me, I really enjoyed it. Yes, I wanted to throw the book across the room. But at the same time, it left it open to allow me to imagine that Rafe and his love interest got together that next semester. I like that ending, and I’m sticking with it. Haha. As you know, I loved the book, even saying this in the blog post I wrote on it: “All I’ll say on the ending is that was extremely satisfying.” While there is a love story in the book, I don’t think the book is a romance. It’s about Rafe figuring himself out and what happens while he’s doing that… as it turns out he falls in love along the way, but that wasn’t the point of the journey. I think the ending is perfect. True, some (or should I say a lot?) readers will disagree with the ending, but, to me, that’s how the ending should be. It’s just right and perfect. Because, in real life, that’s most likely what will happen between Ben and Rafe. I’ve been reading and learning a lot about storytelling in a business context – in fact, I teach a course on it. Many experienced screen writers assert, and I now agree, that the key element of a story is not how it ends, it is the transformation that takes place in the main character. It’s what he learns and how he changes (or she). Our real-life relationships don’t always have neat and clean closure either. I, for one, am fine with how Openly Straight ended. You can choose to write a sequel or not. But if you continued the book with how things went with them the next semester, the book could easily have been 100+ pages longer and you might still be writing it. This is exactly why a sequel is so sorely needed. I GET why it ended how it did for Rafe and Ben. I get it. But the fact is, I feel as though I’m unable to read a queer love story (I am bisexual personally) that has any sort of happy ending. And a book that I loved as much as Openly Straight, to end the way it did, just killed me. It’s great to say now that “oh I’m sure things will improve for Rafe!” But the people who got their hearts and souls invested in the book don’t see that. We can headcanon all day long about what happens in the future. But the ending we got was BLEAK. And it hurts even more with the relationship we saw developing and the characters we fell in love with. I get that these are characters that I didn’t write. An author can do whatever they want. But I, myself, is so sick of depressing endings in queer stories. I picked this up because it was recommended as light and funny. Little did I know I would end it knee deep in tissues without any resolution to the pain. Sigh.